Hi Suzie. I jusst saw your Chevron 2 bag. I really like it. You did a fine job on it. Is it a fairly simple bag to make? I would love to make one for my granddaughter. I think it is fairly simple. No fancy stitches involved. I loved the baskets. They are pretty. I made 'My Little Flapped Bag' for myself,and it is lovely. Now I have been asked to donate it to an auction raising money for cancer research. I need to know whether such a donation would be allowed under the terms of your copyright. I planned to make a little tag identifying the designer, the yarn used, and me as maker of the bag. I would be honored to have one of my bags donated to a charity auction. 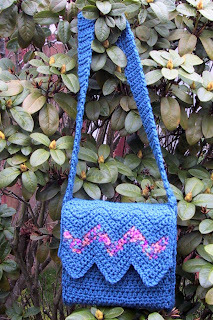 Hi Suzie, thank you for posting the pattern, what nice work.....I completed the bag. For the Flap I alternated 2 colors so the zickzack pattern really appears. I do have a problem how to fasten the strap onto the purse....don't understand the directions....short strap etc.....I need help! Just sew the straps to the sides, in what ever fashion you want. 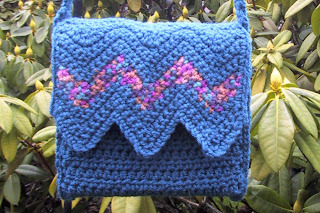 I just finished the Chevron bag as a Kindle case for my daughter. I omitted the strap and will add snaps to keep it closed. Thanks for sharing this pattern. Beautiful Pattern and Thanks for sharing it with the world! Gonna make it for my 2 grand daughters. They'll get a kick out of it, especially the 9 y/o. Thanks again.